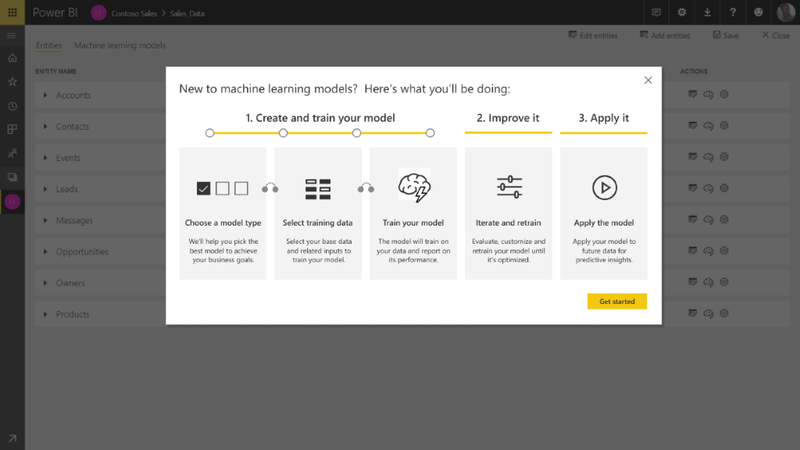 Today, we’re taking a major step forward in bringing AI to business intelligence and announcing several new AI features in Power BI that are available in preview. All these new AI capabilities—pioneered in Azure and now available in Power BI—require no code. This enables all Power BI users to discover hidden, actionable insights in their data and drive better business outcomes with easy-to-use AI. Azure Cognitive Services are sophisticated pre-trained machine learning models that can extract insights from data. 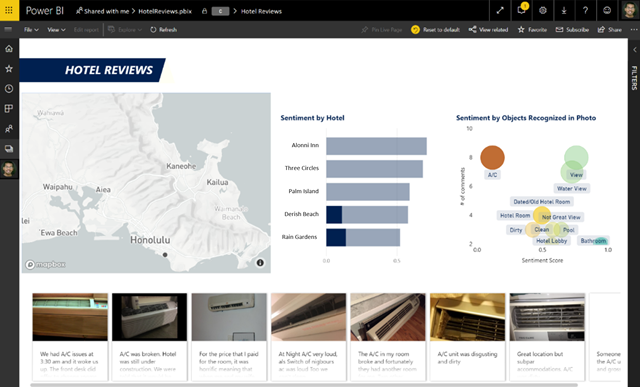 We are bringing Azure Cognitive Service capabilities into Power BI to provide powerful ways to extract information from a variety sources like documents, images, and social media feeds. These algorithms can identify named entities such as organizations, people, and locations. They can recognize objects in images, detect language, identify key phrases, and determine positive or negative sentiment. Imagine you’re a business analyst for a hotel chain and want to evaluate what guests are saying in their online reviews. With Azure Cognitive Services in Power BI, you can easily analyze thousands of online reviews, understand what your guests are happy or unhappy about, and pinpoint areas of improvement. In the example below, the user can understand that a specific hotel has issues with air conditioning, causing customer dissatisfaction and negative reviews. Azure Cognitive Services capabilities in Power BI can surface this insight automatically, so the hotel can take action. Every organization has metrics or key performance indicators that measure business success. How do businesses determine what impacts those KPIs? What causes these KPIs to go up, down, or stay the same? The most obvious business drivers are typically easy to spot, but it doesn’t take long before things get complex. What drives business outcomes is often subtle and depends on any combination of circumstances. As an example, a business analyst could leverage the automated machine learning technology to quickly and easily build a model to predict how likely an open sales opportunity is to be won. This could help a sales manager prioritize which high value opportunities to focus on and how likely they are to meet their target. Power BI is building on years of work in Microsoft Research and Azure, and bringing these capabilities to any business user, regardless of their coding skill. Complex tasks that typically require technical know-how — key phrase extraction, sentiment analysis, understanding drivers, creating machine learning models—will now be possible with just a few clicks and without code. This empowers everyone in an organization to harness the power of AI to make better decisions.